Published in 2003, the Gibbs Smith, Publisher 4th edition has thick, cream-colored 100% post-consumer paste recycled paper, soy based inks, and is distinguished by a metallic gold debossed sun face on the front cover, plus an introduction by communal studies scholar Timothy Miller. Inscription by the author/illustrator is available upon request. This is the classic best-selling guide to alternative country life, Living on the Earth. Entirely handwritten in the author's script and illustrated with her line drawings, it is a practical home reference volume. And the information is relentless-organic gardening, outdoor cooking, crafts, herbology, midwifery, backpacking, survival, first aid, making and playing musical instruments, sewing, pattern drafting, building a kiln, a kayak, an ice chest, making candles, soap, ink, beaded curtains, ice cream, tamales, and, at the end, how to cremate. A list of useful-and magical-books, and addresses for hard to find tools and materials completes the appendices, along with a star map and an old English poem to the moon. Originally published in 1970, Living on the Earth is about permaculture, sustainability, simplicity and environmentalism--words that came into our vocabulary ten to twenty years later. Most of the projects involve recycling--stoves and flotation devices from 55 gallon drums, individual greenhouses from glass jugs, patchwork skirts from neckties. It's about withdrawing from consumerism and finding true happiness through creativity, respectful interactions with nature, appreciation of other people, and consciousness of the Divine. It is a spiritual book that uplifts and instructs largely through the illustrations of people living outdoors serenely and vigorously. The message of the front cover illustration--ecstatic union with the natural world--resonates with people because it is our birthright. Living on the Earth was and is a freedom call to people in all parts of society---yes, it IS possible to find a simpler and more satisfying life outside of the industrial-military complex. Yes, it is possible to live in a world of innocent, smiling nudes, surrounded by things you grew, found or made yourself. Living on the Earth is also a historical document, an insider's view of the communes of the late 60's, today widely used in university history courses. Along with Ram Dass's Be Here Now and The Whole Earth Catalog, it bespoke the joyous upwelling of global stewardship, trusting comradery, and direct communion with the Universal Spirit that marked the era's sudden and enormous counterculture. Living on the Earth is a milestone in twentieth century art. 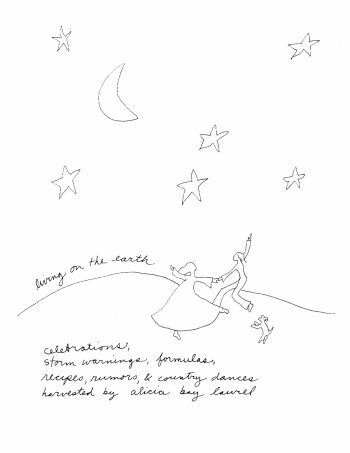 (Publishers Weekly took note immediately with a handwritten two-page review surrounded by Alicia's drawings.) Within months after Living on the Earth was first published, dozens of new books and commercial art (packaging, advertising, giftware designs and greeting cards) based on its design and illustrations began to appear. Its influence is still clearly evident four decades later. Living on the Earth was written, illustrated and designed by a teenager. As such, it speaks to young people as one of their own, daring them to create books, live adventurously, learn the sources of things they take for granted, follow their dreams. Alternative schools (where drawings of smiling nudes are not forbidden) happily use the book as a craft project book for students. In 2012, Living on the Earth was chosen by a panel of food and cookbook experts chosen by the Fales Library at New York University (which holds the largest collection of books about food in the United States) as one of the 101 most influential American cookbooks of the 20th century.